The Egerton Ryerson Award is presented annually to a person or persons who have been both active and public in their advocacy for strong public education. The award recognizes the deep value of learning – from the early years until graduation from high school, and those who have made the connection between strong public education, social cohesion, and strong and engaged societies. 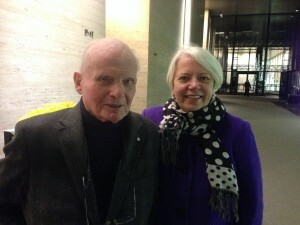 While attending the gala, RULA’s Chief Librarian Madeleine Lefebvre had the chance to talk to the Honourable Bill Davis, former Premier of Ontario (see photo, right). Mr Davis was on hand as a member of the awards committee to pay tribute to President Levy and chatted with Madeleine about the Library and the soon-to-be opened Student Learning Centre. President Levy has been a tireless supporter of the library throughout his tenure as Ryerson University’s President. Our heartfelt congratulations on your recognition!